Haier announced the launch of its slimmest side by side refrigerator – HRF-619KS Black Steel Edition. Haier’s new slimmest side by side refrigerator is designed with impeccable looks and aesthetics to give an upscale feel to the kitchen. The refrigerator with a depth of 655mm comes with advanced features such as Smooth Touch Glass digital control panel and holiday & smart function that help in controlling the temperature settings while the user is away on holidays. It keeps the freezer section on as usual and sets the refrigerator section at 17 degrees Celsius to avoid unpleasant odour while not in use for a longer duration. Keeping in mind space is available in a kitchen, Haier has designed this refrigerator with a 90-degree contour door to allow consumers easy access to fetch all the crispers without opening the entire door. 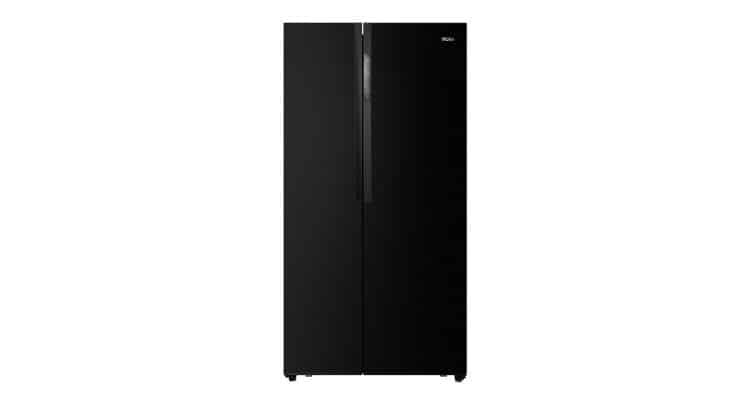 The HRF-619KS Black Steel edition offers an ample amount of storage space and the perfectly balanced ratio between its refrigerator and freezer area i.e. 66% of refrigerator and 34% freezer of the total capacity thus ensuring maximum user convenience. The all new black steel finish of the refrigerator will enhance the overall kitchen décor with its premium texture and style. The unique black steel look is designed to complement both light and dark objects placed in the kitchen while effortlessly adding sophisticated elegance to the aesthetics. The new HRF-619KS refrigerator also comes equipped with super cool and freeze option giving users the access to certain items in the refrigerator and freezer with just a touch of a button. Its smart function, a smart feature based on hi-tech sensors further acts as an internal guide to direct the refrigerator in adjusting the inside temperature basis its contents and other ambient conditions. Moreover, for better visibility and accessibility, the refrigerator is fitted with top LED lights that ensure every corner inside is brightly illuminated. Commenting on the launch, Eric Braganza, President, Haier Appliances India said, “We at Haier, understand the needs of the users’ and continuously introduce new innovations from time to time for greater user experience. With the launch of our slimmest side by side refrigerator in black steel finish, we are expanding our existing range of best-in-class refrigerators with a model that every family desires. Haier has aesthetically designed this range with superior functionality and features that complement the efficiency and style quotient of consumers across all forms of kitchens i.e. modern, traditional and contemporary. With twin inverter technology and smart sensors, the refrigerator automatically adjusts the cooling cycle and minimizes the sound output at home with the latest noise controlled technology.